In the early days of the last century, brothers John and Horace Dodge already had earned a superb reputation for making quality automotive products for other automobile manufacturers before becoming part of the Chrysler Corporation. Records show that in February 1926 a customer by the name of Ernest Mueller took delivery of a special order Dodge Brothers Standard Roadster at the local dealership in Oakland, Calif. If Mueller had traveled to Michigan then the base price of the car would have been reduced to $855. 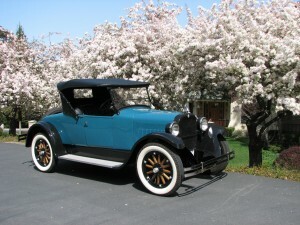 Instead, the right-hand drive Dodge Brothers roadster was delivered in California, with a base price of $962. That price was boosted by another $118 for upgrading to 24-inch wheels from the standard 20 inchers. According to Whitney Haist, the current owner of the 1926 roadster, the vehicle was ordered with right-hand drive because the original owner was an Englishman who did not like driving on the left side of the car. The history of the Dodge Brothers roadster for the next 81 years remains a mystery. In the spring of 2007, after attending church one Sunday, a fellow parishioner informed Haist of a 1926 Dodge Brothers Standard Roadster that was stored beneath a tarpaulin in the nearby town of Lafayette. Following up on the tip, Haist located the car and was infatuated with his discovery, but the Dodge Brothers roadster was in sad shape. A week after buying the non-operational vehicle Haist returned with a trailer to tow his treasure home. He had to pump air into the flat tires and with chains he was able to winch the car onto the trailer preparatory to the 10-mile trip home. After a thorough inspection, a total restoration was deemed necessary if the once-handsome 1926 roadster was ever to motor the highways again. The 212-cubic-inch, “L”-head, four-cylinder engine was rebuilt to original specifications so as to develop 30-35 horsepower. The four-cylinder engine has to propel the 2,473-pound car — and that is an empty weight. Typical of the era, Haist’s vehicle features a Motometer gauge atop the radiator to inform the driver if the car was overheating. If the driver did not notice the warning on the gauge then he certainly would not miss the steam that would soon follow. With the engine rebuilt, Haist turned his attention to installing a new fuel delivery system, as well as replacing all of the wiring in the car. Next on the “to do” list was refinishing the wooden spokes on the four wheels on the ground and the matching spare at the rear of the roadster. Each 12-spoke wheel has a natural wood finish and is wrapped by a 5.25×24-inch tire. The stately roadster comfortably rides on a 116-inch wheelbase. When the time came to paint the completely refinished body of the Dodge Brothers Standard Roadster, Haist decided to go with the same Pheasant Green that was the original color. While the restoration work was progressing the metal trim pieces were sent off to be replated, including bumpers and door handles. A new top was fabricated along with new upholstery to duplicate the original. Once the new interior was in place the only thing left to do was to have side curtains made using the dilapidated originals as sample patterns.